How Did the Secret Service Choose Ben Carson's Awful Code Name? 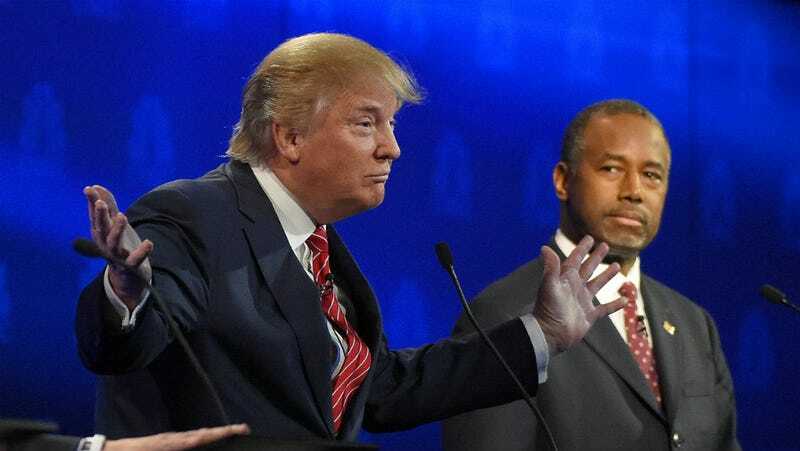 Weeks after grousing that the Secret Service was refusing to protect him due to his Republicanism, both aggravated giant duckling Donald Trump and fellow front-runner Ben Carson have been assigned Secret Service security details. Someone needed to think through Ben Carson’s name just a touch longer. The Secret Service granted both candidates’ requests for protection last week. Time reports that Trump has been given the name “Mogul,” which, while less colorful than anything we might’ve chosen, is fine. Carson’s codename Eli is apparently a reference to “a common name for Yale students,” per Time. It’s also a Hebrew name, originally a high priest of Shiloh referenced repeatedly in the Torah. It’s a weird choice. It sounds like “He lie,” which Carson may be wont to do. It can be rearranged to spell “lie,” for that matter. Some years later, when Samuel had become an adult, the Philistines attacked Eben-Ezer, eventually capturing the Ark of the Covenant from the Israelites and killed Eli’s sons, who accompanied the Ark to battle as priests. (The Israelites had brought the Ark with them to battle under the premise that there was no possible way God would allow it to enter enemy hands, an assumption that proved to be incorrect.) Eli, who was nearly blind, was unaware of the event until he asked about all the commotion. Eli, sitting in a chair, was told what had happened by a soldier who had fled the battle. In reaction to the news that the Ark of God had been captured, Eli fell backwards out of the chair he was sitting in, and died from a broken neck, on the 10th day of IyarHe was a Judge of Israel for a total of 40 years, and died at the age of 98. His daughter-in-law, the wife of Phinehas, was pregnant and near the time of delivery. When she heard the news that the Ark of God had been captured and that her father-in-law and husband were dead, she went into labour and gave birth, but was overcome by labour pains. As she was dying, the women attending her said, Don’t despair; you have given birth to a son. But she did not respond or pay any attention. She named the boy Ichabod, saying The Glory has departed from Israel- because of the capture of the Ark of God and the deaths of her father-in-law and her husband. Hardly anyone in the Torah really gets to die peacefully, but that one is notable in its bleakness. Also, isn’t an Old Testament name a bit of an odd choice for someone whose home is festooned with selfies with Jesus?